In 1965 when Bob Dylan went electric he upset a number of people, he was solely an acoustic folk singer and his new debut sound didn’t sit well with the audience. Perhaps I will also upset some ukulele purists when I discuss the fun of an electrified ukulele. Now I know, the ukulele is an acoustic instrument and most people prefer it that way, but when you can take its signal and amplify it, you can add a whole new dimension and creative level to your final sound. How to Pickup That Uke Sound! A pickup is a transducer that can capture or sense mechanical vibrations that are then converted to an electric signal that is amplified. So the sound waves in a ukulele, guitar, bass, mandolin, or other instrument flow into the pickup and can than be sent elsewhere for processing. Some ukuleles actually come as electric-acoustic and already have a jack in the side ready to plug into an amp. A few ukulele players may be enterprising enough to actually drill a hole into the side body of their uke and install their own pickup. However, if you are new to music and electrified music, I would suggest waiting awhile for a project like that… keep it simple. There are pickups that can be attached to the inside of the uke without any drilling. Of course just like buying a uke the more money you spend the better your pickup will be. I discovered that I had a tuner with a clip on wire I could use. By clipping that wire to my ukulele headstock I could then plug the jack into an amp instead of the tuner. It isn’t the greatest sound quality but works ok for amplifying the ukulele. As usual in life you get what you pay for. Luckily I only use my clip on pickup for jamming with friends and not for public concerts where sound quality is crucial. So why go through the trouble of turning your acoustic uke sound waves into an electrical signal? Well first off sometimes it is nice to amplify your signal and sound. That way you can be heard among other musicians or while on stage. I have played uke on stage with just a microphone and it is not always easy to pick up the sound, especially in a loud room or if you are also singing. But the best reason to electrify your signal is for effects. Of course with the uke we aren’t out to play heavy metal so we don’t need any compressors, distortion, or overdrive. What does sound good though are delays, chorus effects, and reverb, those effects can really add a new element to the overall sound you may be going for. If you have ever noticed on stage a guitar player stepping on pedals to change their sound, well if you electrify your uke signal you can use those same pedals. Reverb can make your uke sound like it is in a grand concert hall as you play it. Delay can provide a beautiful yet subtle echo, with a pickup you can take advantage of many great effects. Those effects pedals I mentioned in the last paragraph? They can get very expensive, an analog delay pedal can cost between $50 and $200. Analog means the pedal is not digital, it uses electric parts to create the effect and analog is expensive. However, in this modern day we have a myriad of digital options. Most people start playing the uke because it is simple, affordable, and easy to transport, you can take your uke just about anywhere even a bus trip or camping. If you own a smartphone, you can also take effects pedals with you anywhere along with your ukulele. Right now is a great time to be alive as a musician, not only can these smartphones provide effects they can also be used as recording studios. I have produced complete and professional songs on my iPad and iPhone, and now even Android has the recording capabilities (originally Android lagged in audio processing, but they have caught up with their competitors). With your smartphone or tablet you can buy a simple interface that allows you to plug your ukulele right into it. The plug from your uke pickup will go right into this interface and then the signal travels into your smartphone or tablet… it is astounding and affordable. There are apps that allow you to use effects like delay, chorus, reverb, gate, and any other analog effect can be recreated digitally. Even if you do not want to use effects you can still directly record your uke right into your phone. Of course if you do not have a pickup or want to use one, they still have microphones that plug into tablets and smartphones. Honestly though with the ukulele it records better with a nice pickup. 12 years ago when I started playing uke, it was expensive to buy recording equipment or difficult to get a good recorded sound on a budget. Now I can make YouTube videos, Soundcloud songs, and even Facebook videos playing the ukulele. I can use simple apps (some even free) to add effects to my instrument and my voice. People who play ukulele are often the creative types, free spirits, and generally a curious crowd. Of course you can always record a simple video on your phone of a uke cover to post online, that is easy. However, it is now also possible to compose a great original track on Garageband right on your device and show your audience how talented you really are. Plug your uke into your smartphone and play an original song with some slight echo, reverb, and chorus that doubles the uke sound. Add a vocal track, drums, or even other instruments to create an awesome sounding and complete ukulele tune. Maybe you can even pick up more of an audience with your original tune! The ukulele is fun to play all by itself, but why not take advantage of some modern technology and expand your ukulele musical horizons! Note: In the picture at the top we we see the pickup clipped to the headstock of the concert ukulele. 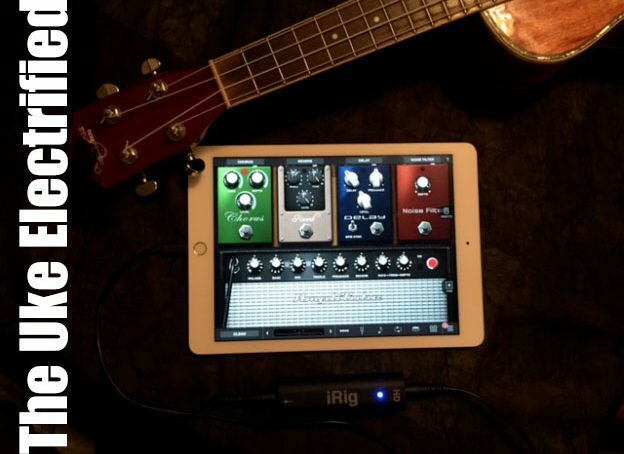 This pickup is plugged into the iRig interface and that is connected into the iPad. I can then use a number of apps for a variety of effects and record that directly into GarageBand. If you have any further questions on recording your uke into your smartphone or tablet, please ask below in the comment section!